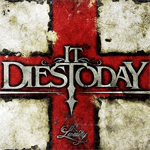 Wanting to spare my son from reviewing another American metalcore band after reviewing four in one week, I decided to tackle the third and latest offering from Buffalo, New York's It Dies Today, Lividity. As always with the current modern metal trends, and especially those of the metalcore persuasion, I suspended my cynicism of expectant repetition and hoped for something new and different. We should not rush to judgment. Well, on the way to our local Guitar Center, we dropped Lividity in the ol' car CD player and crossed our fingers. Our judgment. wasn't a rush, but I can tell you it didn't take more than three songs to determine that Lividity is the same old American metalcore. My son suggested an imagine of a child bounding through a field of flowers on a sunny summer day with It Dies Today or any other similar band playing as a soundtrack: little more than muzak to fill the background. Behind the wheel, I can't say Lividity was even good for driving music. My suspicions that metalcore is becoming the hair metal of the late 1980's is slowly being confirmed with each new album I receive. From Trustkill to Century Media to Roadrunner to Earache, every label from indie to major are patronizing America's youth with sameness and mediocrity. In those LA days, there were literally hundreds of bands competing for venues and record label deals, but they were all doing the same thing (and believing themselves to be different). Today, both bands and labels are doing the same thing over and over again with the expectation of different results which is Einstein's definition of insanity. Equally sad is that my son who fits the demographics of It Dies Today can see through this mediocrity, and he listens to everything from Led Zeppelin to Black Sabbath to Nine Inch Nails and Tool to Killswitch Engage and more. If he's unconvinced, then can we not be spared from this mire of American metalcore or have some creativity injected into it? I wonder. Simply: It Dies Today's Lividity is conventional, same stuff different release date, modern American metalcore. There's nothing new here and no new ground broken. This is blatant commercialism at it's worst: pumping out the same old thing expecting consumers to buy it simply for that reason. Empty your wallet, feed the label status quo, and shift your brain into neutral: you've just become another sucker for the man to exploit. Simply: It Dies Today's Lividity is conventional, same stuff different release date, modern American metalcore. There's nothing new here and no new ground broken. This is blatant commercialism at it's worst: pumping out the same old thing expecting consumers to buy it simply for that reason.